Beautiful Sword, Came well Packaged and wrapped with lots of oil on the blade. It really has a Medieval Look. and in my opinion it would be functional. I would trust this sword in combat! The Hilt and Pommel seem to be of solid Brass. I checked the blade carefully with a strong magnifier and the edge shows it is real Damascus Steel. I received this blade in a scratch and dent mystery box. I was fairly impressed with its sharpness and balance. However, don't let them fool you, this is not a true Damascus blade. It is a printed Damascus pattern on the blade. Mine has a smudge about an inch square where the pattern was disturbed before it was set permanent. I am not saying it's a bad blade, it looks good and feels good but if you want real Damascus steel, this ain't it. If you was this sword and don't care about the pattern, there is another blade on budk that is exactly the same without the pattern and only costs 20 bucks. The sword is quite nice, but there were a few problems. The first major problem was that the sheath is too small and the sword doesn't fit. The second problem was that the blade was crooked, and is quite hard to bend back without tools. Other then that the sword is great. My first impression upon unwrapping this sword, which was well slathered in thick oil, then plastic, then bubble wrap, then a cardboard box, then the big shipping box, was "Wow! what a Fantastic sword." The handle looks like silver and gold, and the subtle Damascus pattern of the blade is beautiful. A sword of a King!. It is even hollow ground on both sides! and quite sharp. There is Only one slightly rough spot about an inch long where the lamination is trying to separate a little. (I count 64 layers of alternating colors of steel, 32 of light, 32 of dark) My next impression, as I tried to put it in the sheath, was, "Oh No! it doesn't fit!" as it would not slide in the last half inch. However, Upon close examination, I realized that it is a simple design flaw in the scabbard. 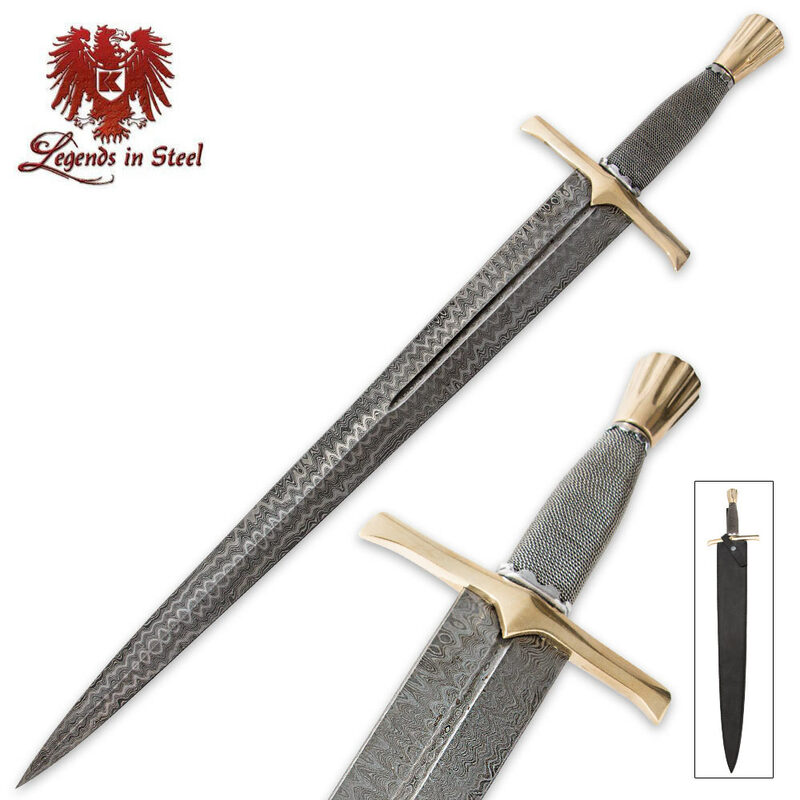 The sword has short triangular langets (the little points of brass in the center of the guard aiming toward the point of the blade) The scabard has a notch cut out for one langet, but no cut out notch on the inside, for the other, so the point of the other langet hits the mouth of the scabard and does not want to go in. It would be difficult to cut a langet notch as this is the point of attachment for the belt loop. It is made worse by the way the sword is shipped with the scabbard shipped underneath the heavy sword, so by the time it gets to you the scabbard mouth opening is a little crushed closed. . I solved this by forcing the 1/2 inch thick handle of a table knife into the mouth of the scabbard and leaving it for a couple days, to force the mouth open wider, allowing the langet to slide in. this worked fine. If it had not, I intended to gently file the points of the langets so they would slide into the scabbard, instead of hitting the edge of the mouth. Also I was going to shave, with a sharp knife, a tiny sliver of leather from the middle of the back of the mouth opening, helping the langet to slide in. However, the stretching with the table knife was enough, and it fits now, with minimal hesitation at the last half inch. I am back to "Wow, what a Fantastic Sword!"